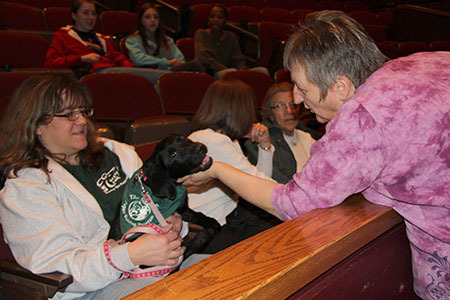 West Windsor, N.J. – A group of very special humans brought some furry – and well-behaved – canine friends to Mercer County Community College’s Kelsey Theatre for a dress rehearsal of “The Miracle Worker” on Jan. 30. Starring in the show as Helen Keller is 11-year-old Isabel Kinney, of Cranbury, who, when she is not pursuing her love for acting, is raising a Labrador puppy named ALu for The Seeing Eye, Inc., based in Morristown, NJ. According to Isabel’s mother, Noel, Isabel became excited about the possibility of serving as a “foster family” for The Seeing Eye after attending a few meetings of the Middlesex chapter with a friend, who is now raising a second puppy for the organization. Noel notes she has six children and had some initial reservations about the added presence of a puppy, but so far, it’s been a delight. “There’s always some chaos around here,” she says of her bustling household, which has turned out to be a great environment for a dog that must learn to behave well in the face of multiple stimuli. Everything converged for Isabel when she learned of the auditions for “The Miracle Worker.” Noel recalled Isabel’s powerful reaction to the story of Helen Keller upon reading the book in school. “She talked about it a lot. As soon as she heard about the role, she knew she wanted to do it,” says her proud mom. Isabel’s fellow puppy trainers decided a trip to Kelsey Theatre was a perfect opportunity to support the young actress, while taking their puppies on an outing to an unfamiliar setting, part of the guidance necessary for these dogs as they prepare for possible lives of service to the blind. “The Miracle Worker,” which tells the famous story of deaf, mute Helen Keller and her teacher Annie Sullivan, is presented by The Pennington Players at Kelsey Theatre Feb. 1-3 and Feb. 8-10. The performance on Feb. 9 will be ASL-interpreted. For ticket information, visit www.kelseytheatre.net. 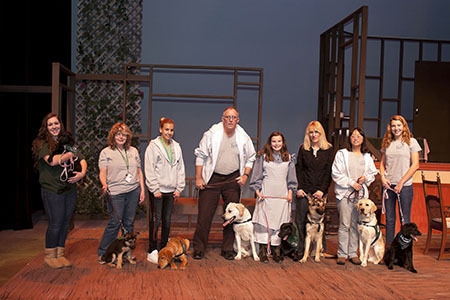 Pictured on stage are Seeing Eye volunteers and their puppies, from left, Samantha Mohr with Giada; Ruth Freudenfels with Jonah; Caroline Waksmunski with Davida; Tom Swenticky with Vangogh; Miracle Worker star Isabel Kinney with ALu; Jerri Dynof with Margaret; Marian Ju-Scozzare with Obie; and Rebecca Casey with Impala. Photo by Joram Freudenfels. 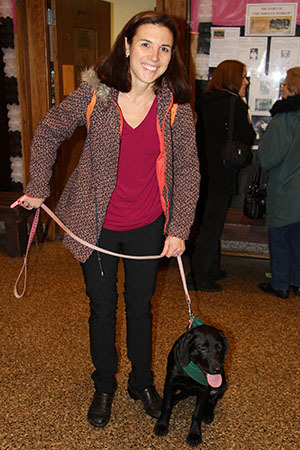 Kelsey's Artistic Director M. Kitty Getlik welcomes a canine patron to the theater. in the Kelsey lobby prior to the show.